Vendor AR teams find it useful to understand the size and nature of an analyst firm’s clients when they are trying to decide if that firm has direct influence on their sales. Analyst firms whose clients are primarily vendors have little direct impact on sales deals because they are not advising IT managers and other technology buyers. Those firms with a significant contract value with enterprises can have a dramatic impact on sales especially through ad hoc, phone-based inquiry (see Don’t discount the business value of analysts’ 350,000+ phone-based inquiries with end-user clients) and signature product or market research (e.g., Magic Quadrant and Wave). In its SEC Form 10-Q, Forrester Research provided some details into its client base. While not perfectly transparent, it does provide interesting insights. The filing reports the revenue breakdown by the three Client Groups, which have their own dedicated sales and analyst teams. There is also an “Other” category which consists “primarily of sponsorships and event tickets.” The “Other” category makes the percentages fluxuate quarter-to-quarter depending on the number of events that occur in the quarter. 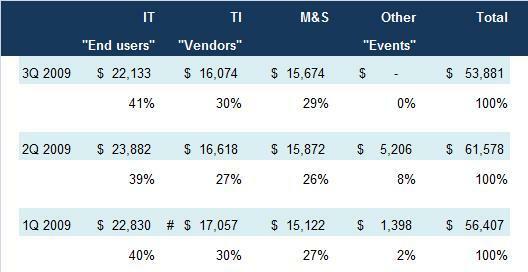 As the table illustrates, roughly 40% of its revenues in the first three quarters came from its IT Client Group, which SageCircle interprets as “end users” at enterprises. This is a critical community for many technology and telecommunications vendors as these are often the primary buyers of technology, especially IT infrastructure (e.g., servers, storage, systems integration consulting, enterprise applications, et cetera). The roughly 29% for the TI Client Group, focused on vendors, represent analysts who primarily advise vendors –although they can advise end users through so-called courtesy views and inquiries – and thus do not have a direct impact on active sales deals. The “Other” segment, the events business, does not have an analyst team so it does not have a direct impact on active sales deals. So does this mean less than half of Forrester’s clients are those prime IT buyers that vendors prize? Not necessarily. The M&S Client Group, which is focused on marketing professionals, has as part of its mission “Objective advice on which tools and technologies will best connect you to customers” (from Forrester’s website). This particular focus should interest vendors as it implies that at least some of the M&S analysts have a direct impact of sales deals. Unfortunately, Forrester does not provide guidance on how much of the M&S Client Group analyst team’s time is spent influencing technology product purchases versus providing “Data-driven insights” on “changing consumer behavior” using Consumer Technographics® survey data. So some percentage of M&S’ roughly 27% can be associated with clients who buy IT and telecommunications products, software, and related services for marketing purposes. Assuming that Forrester’s total business with IT buyers is about 50% and with Forrester’s full year 2009 guidance of $220m to $233m, we estimate that Forrester’s “end user”-like client business is approximately one-seventh that of Gartner’s end-user business. This interpretation of the earnings data might come as a surprise to those vendors who perceive that Forrester is much more of a peer of Gartner. What this exercise illustrates is that perceptions can be wrong and depend a lot on the market space of the vendor. AR professionals need to peel the onion to get the data they need to make important analyst list ranking decisions and understand what is important is the measure of influence of the individual analyst in their market space regardless of the firm. Not even Gartner wields significant influence across all the IT landscape. In some situations, boutique analyst firms and single practitioners can have more relevant visibility or influence than the largest firms. Bottom Line: While Forrester is clearly the number two advisory firm in terms of total number of end-user clients, it should not be assumed that its reach is as great as market behemoth Gartner. AR needs to take a fact based approach when making decisions about allocating resources for outreach activities. Question: AR – What was your perception about the relative size of Forrester’s end-user client base versus Gartner’s?